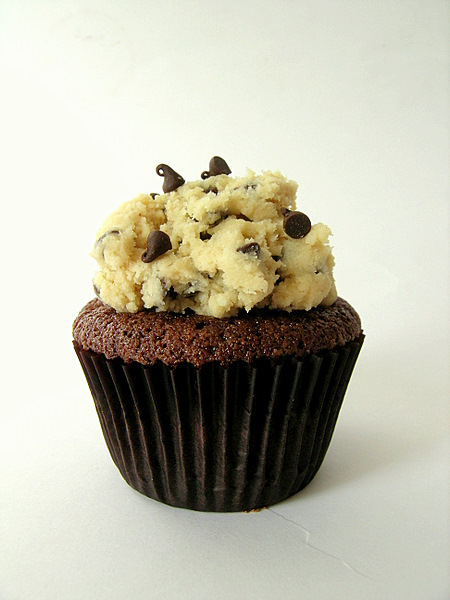 Right before I uploaded a photo of the chocolate chip cookie dough cupcakes that I made today, I noticed that How To Eat A Cupcake posted about her chocolate chip cookie doughs that she recently made – talk about a coincidence! Mine are slightly different that her cupcakes, however. I used a very chocolatey cupcake recipe that I have used for many of my chocolate cupcakes – the recipe can be found here. The cookie dough recipe that I used INSIDE the cupcakes was the recipe on the back of the Nestle Toll House mini chocolate chip bag, and it can be found here. To assemble the chocolate chip cookie dough cupcakes, have a read over this post; it basically follows the same assembly instructions. I used homemade cookie dough instead of store-bought cookie dough, though, and rolled the dough into balls about 1/2″ in diameter. I froze them for a few hours before using them in the cupcakes. For the cookie dough frosting, I used a safe-to-eat recipe without any eggs found at Mama Baker. Even though I already have a good eggless cookie dough recipe, it wasn’t as creamy as what Mama Baker’s looked like in her photos, and this is why I chose her recipe. My inside cookie dough fell to the very bottom of the cupcakes and flattened out; I haven’t had this happen before with my cookie dough cupcakes and I used the same cupcake recipe, so it must be the cookie dough itself. I didn’t photograph the cookie dough inside the cupcake just because it wasn’t too attractive. But I can assure you that these cupcakes are chocolatey, rich and sinful. It will not be the last time I use chocolate chip cookie dough as frosting! Previous Post: « Iron Cupcake: Earth Win! OH MY!!! That cupcake looks amazing!!! It sounds AMAZING TOO! 🙂 Cute picture! Mmmm they do look good! I love the lighting in this photo too. I am a huge fan of cookie dough — used to eat it straight from the roll made by Pillsbury. Am def. adding this to my list of recipes to try! My dad and I just split one and we are in awe! Thank you so much for such an awesome recipe!